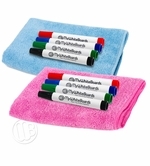 Whiteboard erasers, board cleaners and chart tapes. Everything you need to keep your board clean and operating at top performance. Always use a good quality eraser with your dryerase board. Felt erasers are really meant to clean chalkboards, not dry erase boards. 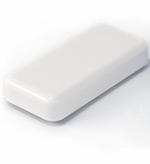 Dry erase dust will tend to clog a felt eraser which can then make your writing surface dirtier when you try to erase. Consider using our Opti-Wipe™ microfiber cloths instead. They trap dry erase particles and may be laundered for continuous use. 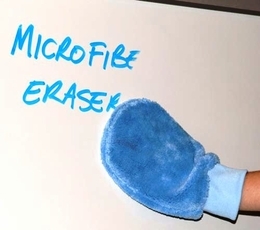 The microfibers clean and condition the writing surface at the same time. Colorful vinyl chart tape is inexpensive way to customize any dry erase board. It allows you to create custom columns and rows and because the lines aren't permanent you can easily remove them to change your chart or graph to suit your needs. If you're looking for a more permanent solution contact our sales team and ask about customizing a board for you. With our OptiPrint™ boards our lines are always straight, crisp, clean and permanent. 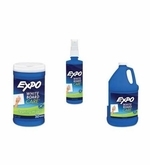 We also carry a full line of board cleaners from Expo. These cleaners work best on non-magnetic Melamine writing surfaces because they also condition the writing surface. 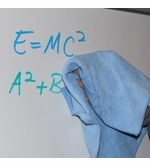 They can be used on porcelain steel magnetic dry erase boards as well but you really should rinse the writing surface after cleaning to prevent build up of cleaning solution which can make the board difficult to erase. Finally, Start Clean! You want to make sure that your board is clean before you start to write on it. Wet a clean soft towel with water and dry your markerboard before you use them, you'll see a big difference. Kit includes our exclusive Opti-Wipes dry erase micro-fiber cleaning cloth in either blue or pink and 4 assorted dry erase markers. The New Teacher's Helper! Quickly clean large dry erase boards better and more efficiently than ever before. New Dry Erase Cleaning Cloths. 16" x 16" Microfiber wiping cloths are fully washable and create less dust that typical felt or bristle erasers. Dry erase board cleaner available in pop-up towels, 8oz. spray bottles sold individually, by the case and sold by the gallon refill jugs. 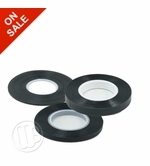 Vinyl chart tapes in multiple colors and in three widths. Used to create your own custom whiteboards and graphs. 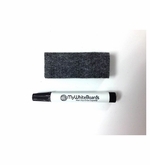 Traditional soft felt chalkboard erasers available in a size of 1 1/2" wide x 4" long.